Cavalier King Charles Spaniels are happy, outgoing, loving little dogs who want to love you and be loved, to run and play in a safe, fenced area and to sleep in a soft bed - preferably your bed, but they're willing to negotiate on that point! They get along well with children, cats, and other dogs. 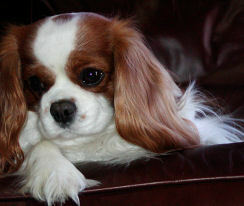 The charm of a Cavalier is their delightfully affectionate, playful nature. They have an intense desire to please and will repay an owner's care and attention with an endearing devotion. This type of personality makes Cavaliers extremely easy to train, however, they do not thrive when left all day without human companionship. They are sporting little dogs that require regular exercise, therefore, being locked up for many hours each day would not bode well for them. They need either a moderate size fenced-in yard in which to run, or a minimum of one good walk each day (in addition to potty walks). They have an instinct to give chase to just about anything that moves, and should either be on a leash or in a fenced yard or they will surely come to grief under the wheels of a car. Cavaliers are indoor dogs. While they are sturdy and hardy and can thrive in both cold and hot climates, they are not dogs to be left outdoors. 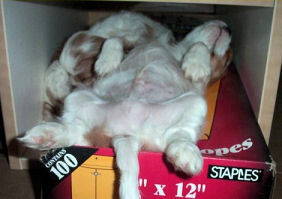 When the Cavalier is young, a crate should be utilized whenever you go out until the puppy is at least one year of age. NEVER leave a dog in a car when the sun is shining on the car as the heat will kill him quickly. Cavaliers are not good guard dogs. While they may alert their owners to the arrival of someone new, they seem to regard all strangers as friends they haven't met yet. 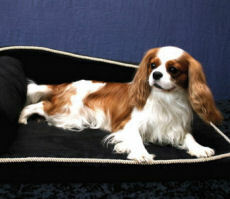 The Cavalier does require regular grooming such as being brushed and combed thoroughly at least once or twice a week. Cavaliers do shed a little all the time. Their nails should be clipped and the hair between their pads trimmed once a month. No other trimming is necessary, or allowed in the show ring. Cavaliers are naturally clean dogs and tend not to smell doggie. They should not be bathed more than once a month and all knots and tangles should be combed out first before a Cavalier is bathed. People who travel find it easy and pleasant to take their Cavaliers along but do take along their "home away from home" -- their crate. Their strong desire to be with their owners makes them willing travelers. Their size and personality contribute to their welcome at "dogs allowed" hotels, marinas, and campgrounds. They can be carried in a Sturdi Bag or Sherpa Bag onto many airline flights and even the larger Cavaliers fit under the seat in front of you on most airlines. Cavaliers are excellent with children, but the age of the children is an important factor in choosing a puppy. Cavalier puppies are only 3-5 lbs. when they arrive in their new homes so young children could inadvertently permanently harm a baby Cavalier. 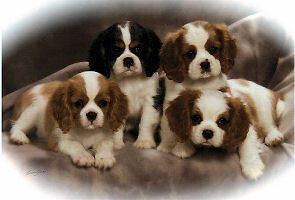 A Cavalier nine to twelve months old is a good choice for a family with children under the age of five. Cavaliers have a long puppy hood and will still be puppies at this age. All children, of course, need supervision to ensure they do not hurt the dog. Retirees, Senior Citizens and empty nesters find the companionship, temperament, small size, and easy maintenance of the Cavaliers ideal. As far as other pets are concerned, Cavaliers are the ultimate groupies and are usually delighted to have the company of cats and dogs of any size. If you have a large dog, you will need to watch your Cavalier puppy carefully while it is small. Cavaliers are spaniels with a strong sporting instinct, therefore they should be watched closely around birds and other small animals as well. The CKCSC, USA Code of Ethics prohibits a puppy leaving for its new home prior to eight weeks of age and recommends ten to twelve weeks as the appropriate age for transfer. Cavalier puppies are very slow to mature and benefit from staying with their mothers and littermates longer than many other breeds. Many people find that an older Cavalier is ideal. There are many advantages, among them that the dog is already housebroken and beyond the puppy chewing stage. Any concern that such a dog will never bond as strongly as one obtained as a young puppy is unfounded. Cavaliers of any age will bond with their new owners. "Love the one you're with" is the Cavalier motto. The CKCSC, USA tries to make sure Cavaliers are never found in pet stores but it is a losing battle. Every attempt has been made by the CKCSC, USA to prevent Cavaliers from falling into the hands of puppy mills or anyone else who would breed them or resell them solely for profit. Cavalier breeders must adhere to the CKCSC, USA Code of Ethics, which specifically prohibits providing any puppies for resale. The CKCSC's Code of Ethics is the reason why it is SO IMPORTANT to buy from breeders who are members of the CKCSC--if you want a healthy, happy, Cavalier with typical physical traits, of a normal Cavalier size (not oversized), and who looks like a Cavalier. This stringent Code of Ethics was written many years ago for the good of the dogs, not the breeders. The CKCSC, USA strongly recommends that all puppies be sold with "restricted from breeding" registration papers to ensure they will not be used for breeding. Any offspring produced by such a dog will not be eligible for registration with the CKCSC, USA. Such a restriction does not mean that a puppy is of poor quality or has health problems. The CKCSC, USA does not believe that it is the duty or right of every Cavalier owner to produce a litter a puppies from his or her Cavalier. Only Cavaliers that have the typical required physical traits which makes them as close to the Breed Standard as possible, have a true Cavalier temperament and have been cleared by the various veterinary specialists of all inherited health problems, should be considered breedable. In addition, breeding and raising Cavalier puppies is not for the faint of heart -- many problems can occur including the death of the mother dog. This is not something to be taken lightly. 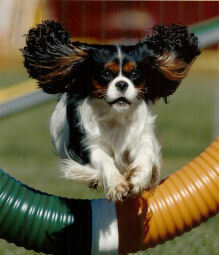 As of January 1996, Cavaliers were fully recognized by the AKC. This recognition has resulted in two national breed clubs, the original CKCSC, USA and the AKC-recognized American Cavalier King Charles Spaniel Club. Early on, the CKCSC, USA applied to the AKC for Miscellaneous status, which was granted in 1962. After several applications by the club to gain full recognition were rejected by the AKC, the CKCSC, USA proceeded to go about its own business. A stud book was established, a show system was developed, and a stringent Code of Ethics was adopted. 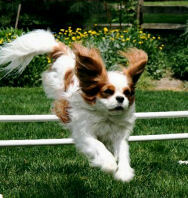 Although few Cavaliers were exhibited in the Miscellaneous classes, CKCSC, USA members did participate in and enjoy AKC performance/obedience events. The CKCSC, USA membership was polled on numerous occasions over the years regarding full recognition, but they felt that the club's strictly enforced, stringent code of ethics afforded the breed a protective umbrella, precluding it from being commercially bred. They had as an example the enormous rise in popularity of the breed in England after Alansmere Aquarius won Best in Show at Crufts in 1973. The vote for full recognition was defeated by a large margin each time it was put to the membership, although Miscellaneous status was retained for obedience enthusiasts. 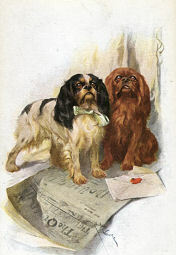 In 1992, the CKCSC, USA was invited by the AKC to become its parent club for the Cavalier King Charles Spaniel, but the membership voted nine to one against accepting the AKC's invitation to affiliate. 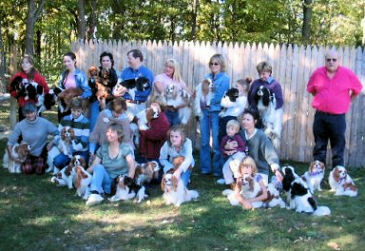 A small group of CKCSC, USA members formed the AKC Cavalier King Charles Spaniel Club, and they applied to the AKC for parent-club status. This was granted, and in March, 1995, the breed was officially recognized by the AKC. The CKCSC, USA continues to operate as an independent breed registry with its own specialty-show system based on the British system. One thing is certain - The Cavalier King Charles Spaniel will continue to be protected by those in CKCSC who are truly dedicated to its preservation. Since AKC started registering Cavaliers, much has changed. There is no question that one change is the popularity of the breed which has soared and this is not a good thing for any breed. Cavaliers dominate the Puppy for Sale Internet sites where disreputable breeders have brought in any females they can find, often poor quality and unhealthy, and are over breeding them to make money off these poor, mistreated souls. The puppy mill, broker, middleman business in the USA is thriving and the only way to stop it thriving is to make sure you, the buying public, know NOT to buy from such people thereby encouraging the continuation of this hideous industry. Stick with the CNE member-breeders list on this website and do not deviate. We are here to help you find the best family companion. One thing that has remained the same over the years is the reason why we all joined the CKCSC, USA and why we continue our membership. Like a family, we have all come together with one common interest; the love of the Cavalier and the protection of the breed. This, with the strong Code of Ethics written over 50 years ago, is the foundation on which we stand. We are all very fortunate to have the opportunity to belong to this special organization that consists of pet owners, breeders, children and even people without a Cavalier at this time. Hopefully we will welcome you into our fold in the future. When you purchase your Cavalier, ask the breeder for the CKCSC Membership Form, fill it in then and there and make a check out to CKCSC, USA for $45 and hand the whole thing to the breeder to send in for you. The breeder has to send in the transfer papers anyway so adding your Membership Form is easy. Make sure you get your buff colored registration papers/pedigree within 3 months or so of purchasing your puppy or you do not own your own dog. It was the late Michael Allen who advertised in her Royal Spaniels Magazine that CKCSC, USA is "America's Best Kept Secret". Michael was a strong supporter of the CKCSC and simply wanted everyone to know that anyone can join! There are so many intangible benefits to belonging and it's not just about breeding and winning . . . it is not. It is about camaraderie, rejoicing in everyone's successes and accomplishments; sharing sympathy in our losses and, most of all, making friendships worldwide that can last a lifetime. You are invited and encouraged to become a member of our extended family by joining CKCSC, USA. You will never regret it.